At NorthBay Healthcare, we treat your family like family. This philosophy rings especially true for a small, community-based hospital system in which our patients are often our neighbors, friends and colleagues. It speaks of the pride we take in providing the best care possible to nurse you back to health, or to keep you and your family healthy in all phases of your life. It’s a system of lifelong accountable care, from birth to hospice, delivering consistent care, better care, for you and your loved ones. Health care should be seamless, from labor and delivery, to primary care, to hospital and specialty care, to discharge, to home care and beyond. We are investing time and energy into innovative integration so that the end result is not how much care you received, but how well you were cared for, and how well you are doing today. a lifelong system of care, because when it comes to your family’s health, our physicians should be part of the big picture. Most busy families have finely tuned schedules to manage their time. But what happens when baby has a cold, the kindergartner needs vaccinations and mom wants a check-up? Juggling multiple doctor’s appointments is one more stress and parents often ignore their own health needs to make sure the kids get to the doctor. Dr. Nancy McAfee, of the NorthBay Center for Primary Care in Fairfield, wants to change all that. 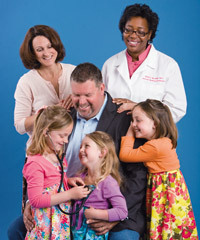 Trained as both a pediatrician and internal medicine physician, she can treat the entire family in one scheduled visit. With a husband, two small sons and an aging mother, Dr. McAfee understands the demands that come with caring for a family. In fact, she planned her medical training to span the lifetime of her patients. “During a family visit I can also identify health issues the family has as a group and make suggestions without singling out any one family member. This works well if you have a family where everyone is obese. I can ask them to take walks as a family and make suggestions to change their eating habits. This also works well when I can identify a family that shares asthma or allergies. Instead of focusing on ‘Sally’s asthma,’ I can recommend that using a humidifier at home will help all of their symptoms. I find that parents really appreciate making a family connection to a problem. “A family appointment also makes the visit more relaxing for the child. It takes the fear out of an appointment when a child can see siblings or parents getting examined first.” To schedule an appointment with Dr. McAfee, call (707) 646-5500.